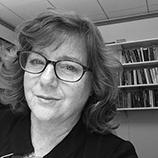 Catherine M. Cole is Professor of Drama and Dean of the Arts at the University of Washington, and the author of Performing South Africa’s Truth Commission: Stages of Transition (2010) and Ghana’s Concert Party Theatre (2001). Cole has co-edited the book Africa After Gender? (2007) and special journal issues on “African and Afro-Caribbean Performance” and “Routes of Blackface” for Theatre Survey and TDR, respectively. Cole’s disability dance theater piece Five Foot Feat toured North America between 2002 and 2005. She has published articles in Africa, Boom: A Journal of California, Critical Inquiry, Dissidences: Hispanic Journal of Theory and Criticism, Disability Studies Quarterly, Research in African Literatures, Theatre, Theatre Journal, Theatre Survey, and TDR, as well as numerous chapters in edited volumes. Cole has held previous positions as Chair of the Department of Theater, Dance and Performance Studies at the University of California, Berkeley, and as senior editor of the journal Theatre Survey.